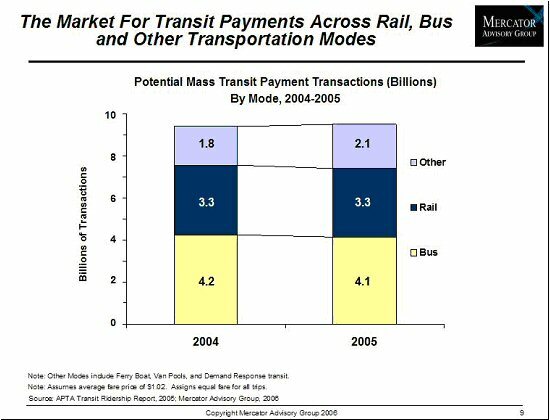 This individual Report A True Test For Contactless Payments: The Market For Open-Network Transit Solutions is available for purchase. This Report is available to members of Mercator Advisory Group’s Emerging Technologies Advisory Service. Please be advised that this Report is normally part of a research and advisory service that provides ongoing support throughout the year. As such, this Report contains significant depth of content that is selected for its strategic importance to our members. (For a description of these services, see our Advisory Services section). Despite consistent marketing by key parties to the contrary, contactless payments have yet to demonstrate a substantiated impact on retail purchases. Luckily for the providers of contactless solutions, the technology has demonstrated a considerable utility for driving efficiency in at least one segment with particularly high volumes, small average ticket sizes and an absolute requirement for maximizing throughput. Contactless transactions have been available in mass transit systems since 1996, and though the technology has been historically deployed in only closed loop environments, we are beginning to see a concerted effort on the part of branded associations to drive open network payment integration into closed transit systems. "The sheer volume of potential payments combined with an increased understanding of how best to both rapidly and cost effectively process small payments makes contactless solutions for mass transit so compelling. With the right implementation, we are looking at the potential for 9 billion new electronic payment transactions on an annual basis in the US alone," according to Michael Friedman, Director of Mercator Advisory Group's Emerging Technology Practice. In this latest report, "A True Test For Contactless Payments: The Market For Open-Network Transit Solutions," Mercator Advisory Group identifies the potential market size for transit payments in the US and looks internationally at the deployment of closed loop contactless cards. The report explores the potential market across different modes of transportation and the benefits of integrating open payment solutions into presently closed loop transit payment systems. The report considers the challenges to integrating closed transit systems. Stemming largely from the need to minimize the transaction time, branded associations are exploring a host of innovative solutions through the use of both their networks and outside solution providers. The report explores the impact and response to factors including small ticket size and variable fare pricing in addition to other considerations. Finally, the report identifies leading players in contactless transit system deployment. The report is 25 pages and contains 6 exhibits.